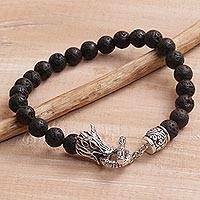 Leather and Sterling Silver Braided Bracelet from Bali, "Soulful Trio"
Lava Stone and 925 Silver Beaded Dragon Bracelet from Bali, "Dragon Glory"
Exuding glory and strength, this men's bracelet from Bali is beaded with bold, natural lava stone. 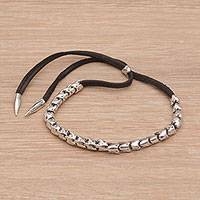 Amsara Putra designs the bracelet, adding a fierce, sterling silver dragon at the clasp. 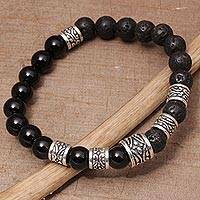 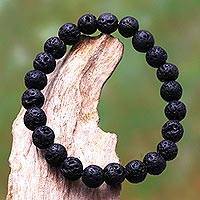 Onyx and Lava Stone Beaded Stretch Bracelet from Bali, "Batuan Renaissance"
Handmade Sterling Silver Cord Bracelet from Indonesia, "Silver Class"
Sterling silver beads line a black faux suede cord in this bracelet from Indonesia. 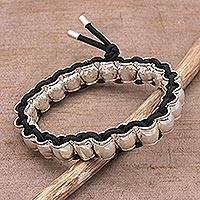 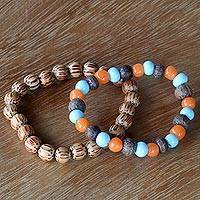 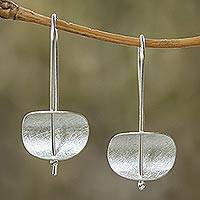 Designed by Henry Anthony Sanny, the handmade bracelet has a classic design that will spruce up your style.